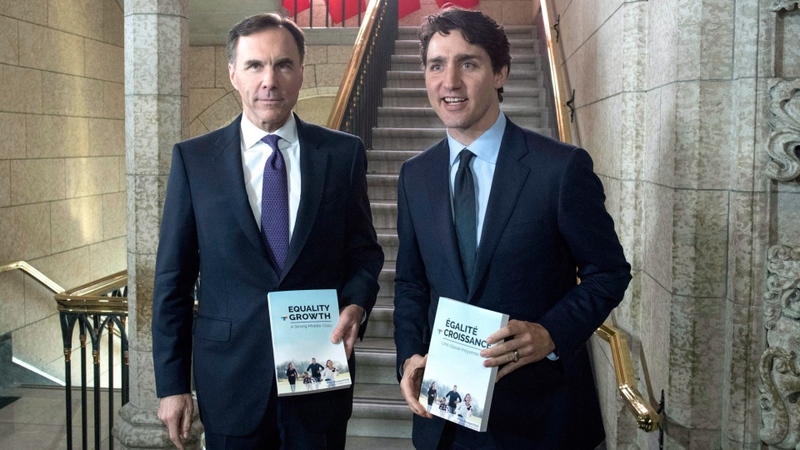 OTTAWA -- The federal government is putting an emphasis on gender equality in the 2018 budget, but proposes only modest new spending as Canada’s economy continues to perform well. The 2018 budget focuses on increasing the number of women in the workforce, and also emphasizes investments in technology and research. Total new spending over the next year comes in at $5.4 billion, of $338.5 billion in overall planned spending. The federal government is projecting an $18.1 billion deficit in 2018-19, dropping to $17.5 billion in 2019-20. During the last federal election the Liberals pledged to not run deficits over $10 billion and said they’d return to balance by 2019, a promise their own numbers now indicate will not be kept. Canada’s federal debt as a percentage of GDP is projected to fall from 30.4 per cent in 2017-18 to 30.1 per cent in 2018-19. The GDP growth rate is projected to slow from 3.0 per cent in 2017, to 2.2 per cent in 2018, bottoming out at 1.6 per cent in 2019. Budget 2018 includes a $3 billion adjustment for risk in 2018-19 and following years. "The government numbers show that the pace of economic growth in the economy is going to slow, and this is going to limit their tax revenues. This is one of the reasons why this is a very modest budget," said Conference Board of Canada’s Craig Alexander. "Their fiscal projections really haven’t changed from last year; they’re on the same course that they were on before." In the 370-page document, the government offers no direct response to uncertainty in the country about the fate of NAFTA and the competitive corporate tax rates in the United States. 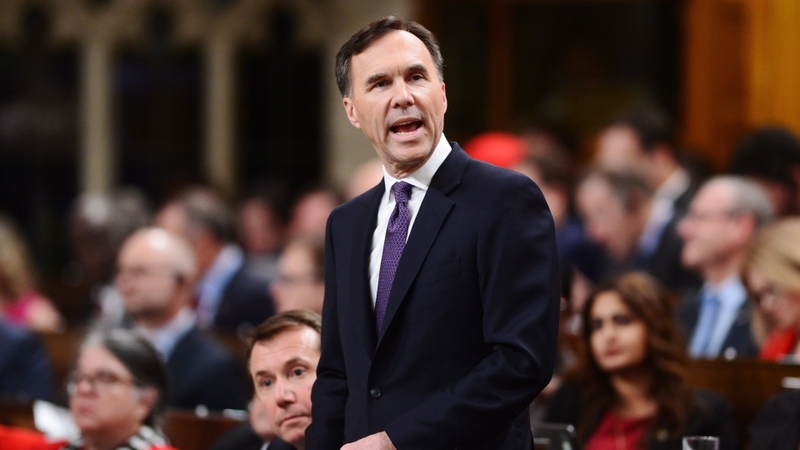 In his remarks to reporters inside the budget lockup, Morneau registered the concern and didn’t rule out future measures to address the loss of competitiveness. “We’re looking at how we can have a really good long-term impact, and I will say that we are doing it in a fiscally-responsible way… which allows us to deal with the challenges that we may face,” Morneau said. Economists view the 2018 budget, titled: “Equality and Growth for a Strong Middle Class”, as a largely status quo spending plan. “I would characterize it as a stay the course budget, sort of a stock-taking prior to next year’s political budget; that will be the one to watch,” said Fred O’Riordan, leader in tax policy for Ernst & Young LLP. Informed by gender-based analysis from each and every government department for the first time in Canadian history the federal budget and all measures proposed have been assessed for how they will impact men and women differently. The federal government is hopeful that the various 2018 budget measures to encourage women’s participation in the workforce will lead to growth in the Canadian economy in coming years. "When you look at all of the different aspects… it is saying that if you want true equality it has to go through all of the initiatives in the budget and that’s what we’re seeing here," said Claire Beckton, executive director of the Carleton University Centre for Women in Politics and Public Leadership. One of the marquee gender equality-focused announcements in the federal budget: the implementation of pay equity legislation for federally regulated sectors. The pay equity legislation will be wrapped into the 2018 budget implementation bill. This long-promised policy is aimed at closing the wage gap, making it so men and women receive equal pay for the same work. Currently in Canada, women make around 88 cents for every $1 a man earns. In what could be viewed as a response to the #MeToo and #TimesUp movements, the budget includes $50.4 million over five years to address sexual harassment in the workplace. Of this, $25.4 million will go to increasing legal aid funding. The government also intends to amend the Parliament of Canada Act to make it possible for parliamentarians to take maternity and parental leave. Currently no such provision is available, leaving MPs to have to work out case-by-case leave scenarios with their parties. This is part of a bigger promise to take steps to make Parliament more family friendly. Other measures that fit the government’s broader gender equity theme are: $86 million over five years to build on Canada’s gender-based violence strategy; $30 million over three years for research and promotion of women and girls’ participation in sport, with a goal of gender equity at all levels by 2035; and, $19.9 million over five years to pilot an Apprenticeship Incentive Grant for Women in male-dominated trades. In addition to multiple nominal funding to promote gender equality, the budget sets aside $105 million for a “nationally co-ordinated, regionally tailored” fund for women entrepreneurs. “Every single decision on expenditure and tax measures was informed by GBA+,” the budget reads. The McKinsey Global Institute estimates that taking steps to advance gender equality, Canada could grow its economy by $150 billion by 2026. The federal budget earmarks $1.2 billion over five years, starting in 2018-19 to introduce a new Employment Insurance Parental Sharing Benefit that will provide five extra weeks of “use it or lose it” EI parental benefits when both parents share the leave. This option is expected to become available in June 2019. In the budget, the federal Liberals announce the creation of an Advisory Council on the Implementation of National Pharmacare to address the affordability of prescription medication. The council, which will be led by former Ontario health minister Dr. Eric Hoskins, will “begin a national dialogue,” meeting with experts as well as Indigenous, provincial and territorial leaders to recommend a way forward. Though, no specific money is attached to this pledge. The government is also overhauling the Working Income Tax Benefit, now being called the Canada Workers Benefit. It will take effect in 2019 and will increase the maximum benefit by up to $170, meaning in that year a low-income person earning $15,000 a year could receive up to $500 more in a tax credit than in years past. In an interview with Don Martin on CTV’s Power Play, Morneau said the initiatives the government has brought forward in past budgets have made "an enormous difference" for women and families and he views the latest round of budgetary measures as going "a step further." "We're just saying that an economy works if everyone has access to work opportunities, if everyone reaches their maximum potential and that's what we're trying to achieve for women because we know that what that's going to drive, is a strong economy for all Canadians," Morneau said. 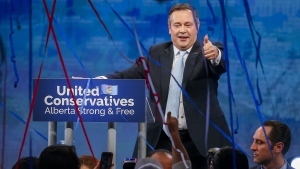 Conservative Leader Andrew Scheer was critical of the government’s fiscal plan. “Justin Trudeau promised he would spend money on infrastructure that would grow the economy over the long term, but the reality is that infrastructure investments are actually being cut, things like roads, and bridges, ports and highways,” he told reporters after the budget was tabled. "These are the facts to remember when we hear the Liberals trying to take credit for our recent economic performance or when they talk about helping families." Scheer also said that Trudeau has failed to keep his promises to the middle class, while raising taxes on businesses. "What he gives with one hand, he takes more with the other," he said. "So it doesn’t show a true commitment to actually implementing pharmacare," Singh told reporters. Green Party leader Elizabeth May said that while there are positives in the budget, and as a feminist she was pleased to see progress on pay equity and more money for science, she still thinks the government isn’t going far enough to address the impacts of climate change, and said pharmacare is the only "big new idea" included in the budget.